Quails are cute little birds, tasty to people, cats and other predators. Bobwhite quails are common throughout the United States while pharaoh quails, also known as Japanese quails (Corturnix Japonica) are found in parts of Asia. These diminutive fellows have different looks, homes and habitat. The bobwhite is bigger than the pharaoh quail, tipping the scale at about 7 ounces and standing around 7 inches tall. The male of this species is reddish-brown on his upper part with a pale, streaked belly. He sports a white stripe above his eye and a white patch on his throat; the lady in the family has a caramel-colored stripe and patch. The pharaoh, or Japanese quail is smaller. The female outweighs the male, weighing around 4 to 5 1/2 ounces, versus 3 1/2 to 5 ounces for the male. The male pharaoh quail shows rusty-brown feathers on his lower breast and upper throat, while the female's feathers in the same area are longer and pointed, as well as a light cinnamon color. If you live in the United States, you're likely to encounter bobwhites in many parts of the country. Though you won't spot one in the western United States, you'd find bobwhites anywhere from the Midwest to the East Coast, from north to south, where they're popular game birds. You'll have to do some traveling to spot pharaoh quails, who are found in Japan, Korea and China; a few populations have been introduced in Italy in Hawaii. Many pharaoh quails migrate, wintering in Vietnam, Laos, Cambodia, Myanmar, Bhutan and northeastern India. Pharaoh quails are drawn to open habitats, such as meadows, steppes and dry mountain slopes close to water, though some prefer to live in grasslands. These guys enjoy eating grass seed and plant matter, as well as land-dwelling invertebrates, such as worms and insect larvae. Bobwhites prefer grasslands that offer a mix of exposed ground with the protection of woody vegetation. Their roosting needs may change according to season, depending on what's available for nesting in the spring and summer, and on food availability during the fall and winter. 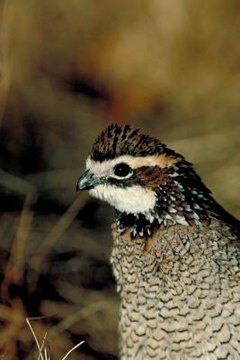 Like pharaoh quails, bobwhites eat seeds, insects and plant matter. Both bobwhites and pharaoh quails are considered near-threatened by the International Union for Conservation of Nature and Natural Resources. Bobwhites are threatened by habitat loss, harsh winters and increasingly aggressive agricultural practices. Pesticides can be harmful, as the birds ingest insects affected by pesticides. Predators such as cats, coyotes, raccoons and snakes are also a problem for bobwhites. Agricultural change and habitat loss are also threats to pharaoh quails, as is hunting, particularly in Japan. Are Crows the Same As Blackbirds?